If you’re thinking of setting up business in China, you’ll have to know the procedures under China law which allow you to do that. If you’re planning to stay in business in China, you should know how the law will approach various contingencies likely to arise – some of them to be expected, some of them perhaps unpleasant surprises. While there are of course many resources that offer you help in this regard, China Master Business Law Guide: Commentary and Analysis sets itself apart with detailed and systematic analysis that brilliantly exposes the commercial realities of investing in China. 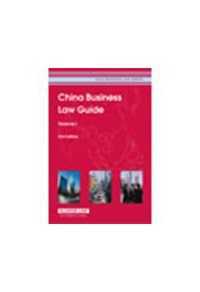 It brings together in one accessible publication a discussion of all China’s laws affecting business, in conjunction with each law’s practical application in virtually any situation likely to arise. Emphasising practical matters, the commentary is specially designed to help foreign investors and legal practitioners gain a sound working knowledge of doing business in China within its legal framework. Along with its two forthcoming companion guides – which will provide cases and legislation – this guide will be there for you with quick, authoritative answers, every time.